As well as there is a phase in every child´s life when he wants to be a firefighter and a building worker, there is inevitably also a time when a young kid is mad about pirates: Well, this diagnosis is valid for my own childhood and for my own children at least. At the age of 5 years I am reading Robert Louis Stevenson´s “Treasure Island” to my kids now and it is with utmost pleasure to witness their eyes turning big and watching their fantasy spinning their heads around when they re-enact the story and dream themselves to the faraway shores of the Caribbean, standing on the think planked decks of their privateer ships, raining their imaginary sabers commandeering a screaming crowd of fearless pirates. Fascination for pirates never really left me – and I was so pleased learning that Pay TV company Starz Originals did produce a pirate series that really blew my mind. In short: “Black Sails” is a four season TV-show that portrays the events which finally lead to “Treasure Island”. It takes place in the Bahamas archipelago of the Caribbean around the years 1710 1720, some 20 years before young fellow Jim Hawkins and then old Long John Silver cast off from Bristol to retrieve Captain Flint´s treasure. So, the whole crew of “Treasure Island” will be introduced to us, Captain Flint aka James McGraw, John Silver, Israel Hands, Billy Bones and of course Ben Gunn. I was so enthusiastic during the first episodes of the first season that I ate up the shows one after one watching “Black Sails” until deep in the night. This show is so awesome that my stock of superlatives will be quite stressed in this article, be warned: I love “Black Sails”! The series is bristling with a colourful depiction of pirate life in the Eighteenths Century. Shot in South Africa, the story takes place in Nassau. It´s a lustful, lush and rich equipped spectacle and it is a great pleasure to see with how much lust and passion the makers of this series have approached their works. Everything seems solid and “real”, no wobbling of cookishly assembled props, no easy destruction of all too seemingly plywood-made props. The stuff here is as “hard” as the people shown. Right from the start the series makes that very clear – this is no misty-eyed, comedy-spoiled “Harr harr”-pirate shenanigan, this is the real stuff. 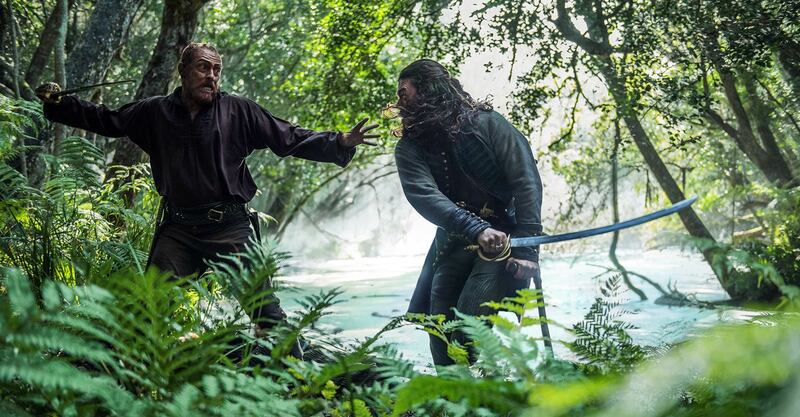 Aficionados of the “good ol´ times” will love BLACK SAILS definitely! When the ships are fighting, sailing, firing, getting boarded, burnt, sunk or attacked, it´s real timber that is splintering. The sailing manoeuvres are depicted in a realistic way, so is the blood: “Black Sails” is brutal. Blood is splashing, wounds are opened up by knives and sharp sabers. When a cannon ball hits, the terror of a thousand hot splinters dashing around ripping people´s stomachs apart and crackle men to bloody mist is shown in a realistic way. I´ve read in the credits that each show was screened to historians – and most of them didn´t had a single thing to criticize. Well, apart from the all-too modern healthy teeth of the characters. But I guess showing toothless brown stumped stinking men and women would have been a blow to the audience rate as well. How does a pirate ship function? Did you knew this? “Black Sails” is a didactic play as well. The “pirate democracies” are well known for their flat hierarchy when it came to their bosses. “Black Sails” delivers a very deep insight in how the pirate society worked: A captain being chosen from men who threw their hat in the ring – elected in a democratic way. Well, apart from the fact that even among the pirates casting votes meant to “buy” voters and persuade them to follow a certain program or another. How had the pirates been organizing their business? BLACK SAILS answers. 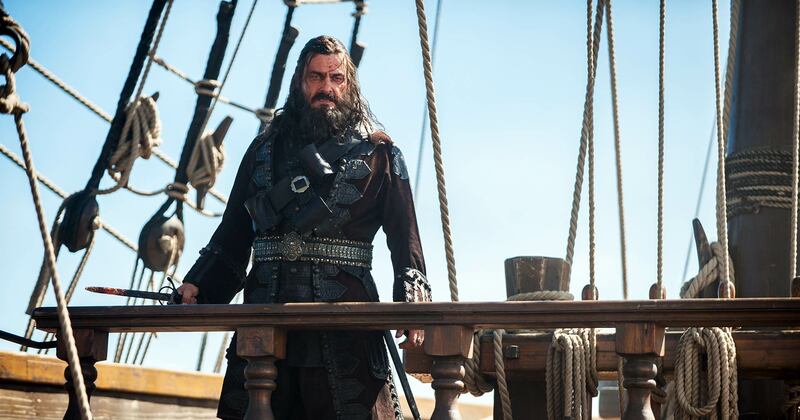 We get to know the crew of the WALRUS, the notorious ship of Captain Flint, very intimately: The shipmates, who have also been elected by the crew, had to speak with the crew´s voice in liaison to the captain. The helmsmen, the accountant, the sailors themselves. “Black Sails” offers a vivid picture of their life and work aboard a pirate ship – and of course, of their lives ashore. Pirates of New Providence Island roam the streets of Nassau, squander their money in taverns and amongst the whores. 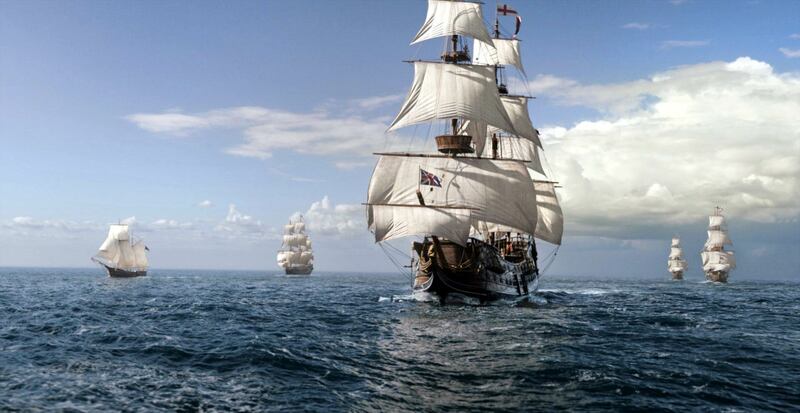 By the way, women in “Black Sails”, that´s a story for themselves. One might criticize the show for its one-sided portrayal of female characters: The lush and all-too simple constructed prostitutes of Nassau, seemingly weak figures, being slept with, beaten, robbed, raped and killed. But the show will eventually evolve – and with it the female characters. Speaking of characters. “Black Sails” is full of the almost complete panopticum of legendary names of pirates. Not just do we get to know all essential names of Robert Louis Stevenson´s “Treasure Island”, the old crew of Cpatain Flint with – of course – Long John Silver (getting explained why not-so tall John Silver receives his nom-de-guerre “Long”), the notorious Israel Hands (later being killed by young Jim Hawkins), Billy Bones (and yes, we will learn why Billy will later be hated by the crew and hunted) and all the other. But there is more: “Real” pirates! Starting with Charles Vane, who died in 1721 in real life, one of the main antagonists of the show who will later turn out to be a “good guy”. In his crew (that´s historically certified) was a man called Jack Rackham and a women named Bonny Anne. Both play an integral part in “Black Sails” and will stay with the show throughout the whole of them 4 seasons. Bonny Anne is one of the most interesting figures (both in real life and in the show) with her mate, later Captain Jack Reckham who is considered to be the pirate who invented the classic Jolly Roger, the black pirate flag with the all too well known skull with the crossed swords. Bonny Anne dies in 1718, Reckham in 1720. Last but not last, Captain Blackbeard will appear for a couple of shows and he receives the most voluptuous death of them all in the show. But I don´t want to spoil you. 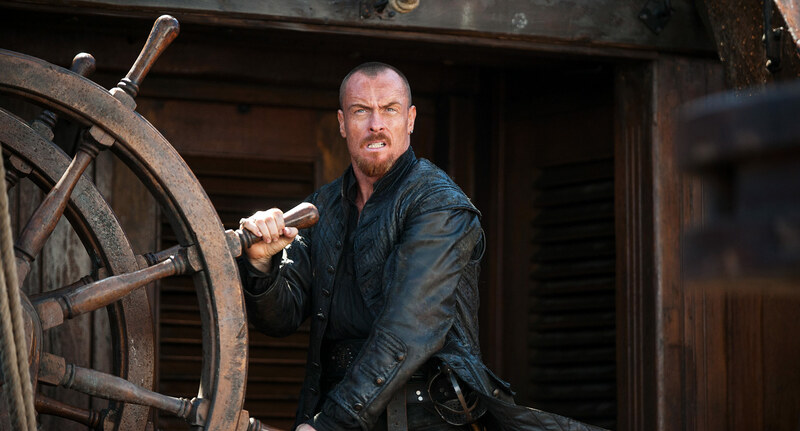 What fascinates me about “Black Sails” is the lust with which the screen writers used the real names and parts of their real life to enlace them with the fictional story of Captain Flint. It´s a pure pleasure to watch – from show to show. By this, “Black Sails” is a great, great TV-show for all who are interested in a rich, colourful, fast played and exciting pirate series. But it is more indeed. The story offers numerous cliffhangers right until the very last show. It´s not just how the big treasure is being won and buried so that Jim Hawkins can find it 20 years later, it is a whole universe by its own. The story is about love and passion, about the burdens and bonds of the life in the British Empire, about democracy, its limits, about revolutions, revelations and so much more. full 10 of 10 points, no matter what other reviews, be it rotten tomatoes or not, tell you. Watch it, it´s worth it!